May 20, 2016, 9:55 a.m. The insurgent Democratic candidate has been making gains with key groups, but too slowly to catch Hillary Clinton. In primaries on Tuesday Hillary Clinton eked out a win in Kentucky, while Bernie Sanders notched a nine-point victory in Oregon, giving him his 21st win. It’s news, but it left the primary in limbo, exactly where it’s essentially been since Super Tuesday: every time it looks like Clinton might close the deal, Sanders comes back with a win — but it’s never a win big enough to suggest he can reverse Clinton’s commanding delegate lead. This is visible from YouGov’s national polling of the race, which showed Sanders narrowing the gap with Clinton, but never taking the lead. The weekend before the Iowa Caucuses, Clinton had the support of 52% of likely primary voters, now it’s 50%. 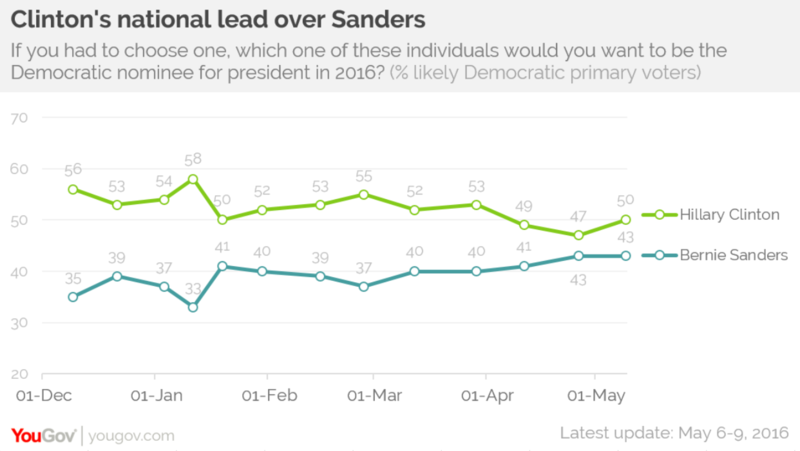 Sanders had 40%, now 43%. The shifts have been bigger along some demographic dividing lines than others. Take race and ethnicity, an increasingly important factor in an increasingly diverse Democratic Party. From the first four contests (Iowa, New Hampshire, Nevada and South Carolina), it was clear Clinton did better with African Americans and Sanders’s strengths were with whites, particularly in more liberal states. Even then, it was clear Sanders would have to broaden his appeal, something his campaign said they would do once voters got to better know him as a candidate. 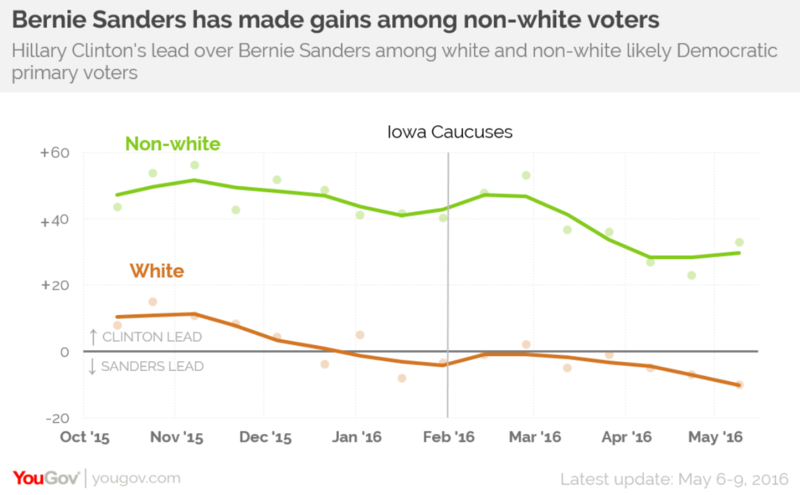 Using YouGov’s national polling as a guide, Sanders has made real gains with non-white voters since late last year, but Clinton has retained a substantial edge. And the progress appears to have stalled since March. Indeed his weakness with non-white voters, particularly with African Americans, is reflected in his performance in states with larger black populations. He has not won a single state where African-Americans make up more than 10% of the statewide population, with the notable exception of Michigan. His 26% support among African Americans in Indiana on May 3rd (according to exit polls) is almost identical to the 28% support he received in neigboring Ohio on March 15th. 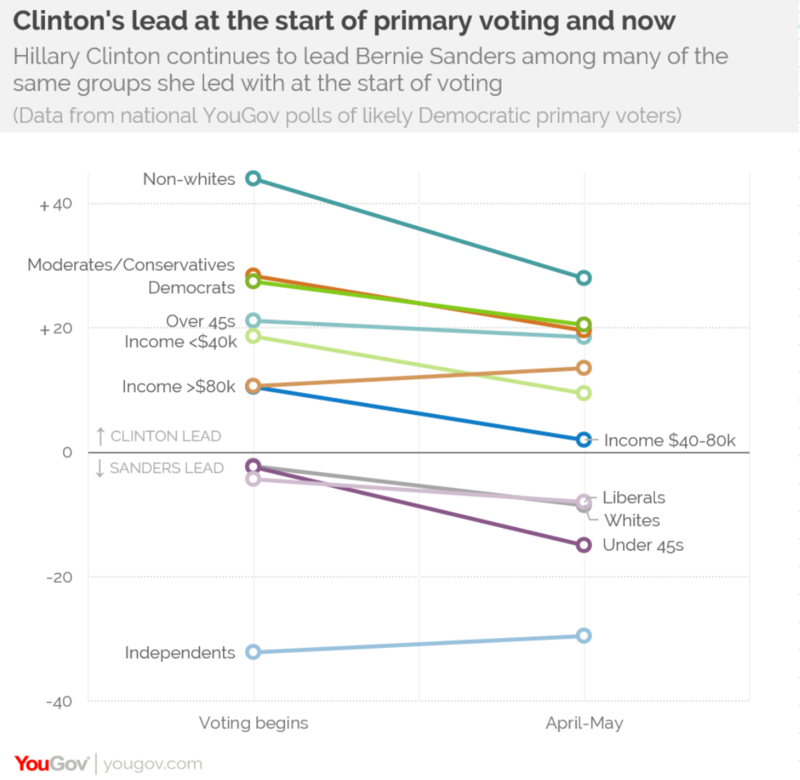 In the chart below, we&apos;ve shown Clinton&apos;s lead with key groups when voting began (an average of YouGov&apos;s two polls right before and after the Iowa Caucuses) and in the latest two YouGov/Economist polls. Notice Sanders has gained support in most areas, but none of these groups have moved from Clinton&apos;s column to his. 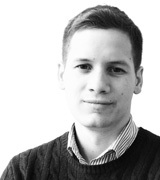 The groups he led with around the time that voting began – independents, liberals, whites, and young people – are the same groups he leads with now. It’s been enough for Sanders to keep winning states that look like New Hampshire or Utah, but not enough to keep him from getting thumped in states like Maryland or New York. When the last group of big states, including New Jersey and California, vote on June 7th, something will probably change. Namely, with the help of superdelegates Clinton is almost certain to reach the 2,383 delegate threshold and become the “presumptive” nominee. But beyond that, it may be the same story the primary electorate has been telling since voting began.